i'm new to the forum and this is my first post. I suppose this is an unusual thing to post here, but please bear with me.My 4-year old son (big LEGO fan since age of 3, when i started to give him my (by now vintage! :D) childhood LEGO sets) will soon turn 5. He has become good at building and he follows instructions effortlessly, even on a Technic set, which he recently got. I want to make him a very special present and i do not want to just buy yet another LEGO or Technic set - i want it to be one of a kind. Also, at his age an RC car would be a great present and even better if it's LEGO Technic. So the 4x4 crawler would be great, even better would be the 41999 - it's just cooler than the stock model and my son likes it better too. But it would be just another "off the shelf" present. 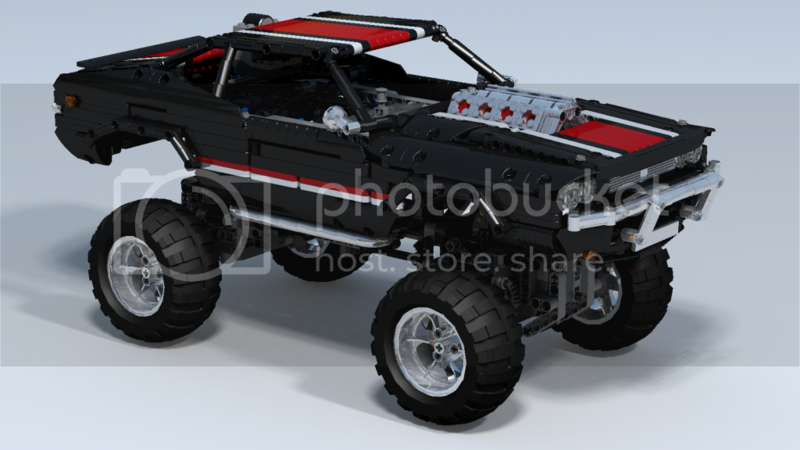 I got inspired by the 41999 set - a different chassis on the 9398 Crawler - and downloaded Lego Digital Designer to experiment around. About me - i'm 30, i have built lots of stuff with LEGO as a child, and now and then i build something together with my son, but i have never owned a Technic set and my only experience with Technic is when i looked how my son assembled a Technic bike set. Also, i have never ever before used LDD. So it's 3 new things for me - eurobricks, Technic and LDD. Anyway, to cut the long story short, i put tons of time into this and i was initially only aiming to see how far i can get on my own in regard to the exterior, the visuals, by doing things that should be possible in real world, but without building the proper structure underneath the exterior. I got surprizingly far, although there are many issues that need to be ironed out on the exterior too (especially the top - i wanted it to be angled, but didn't manage to do it properly. On the other hand, i really like the looks of the model altogether, but i will never be able to design a proper structure that holds the chassis and that holds steering mechanisms, motors, etc. Also, i won't be able to do any design of the mechanics themselves - i've never held a Technic gear in my hand and this structural design is just too advanced for what i can pull off (and i won't have so much time to learn all that stuff til my sons birthday). For someone like me without any experience with this, it is very time consuming to find all the proper parts that might come in handy - that's the biggest handycap as i realised soon - not knowing by heart, what parts could solve a certain problem - that's especially the case with converters, angles, joints and their various types, etc. LEGO has canceled the designed by me service, which might have been another option where to find help. Hence i really hope for your help guys. I was thinking that i could provide the LDD file with the chassis, which i hope can inspire others and, please, feel free to borrow stuff. 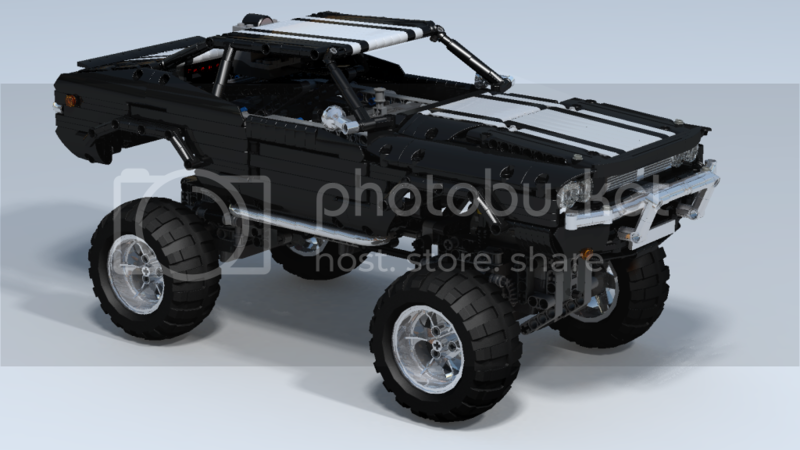 But i would be really grateful, if someone who is good at building, could come up with the underlying structure that would be needed for this chassis to play nicely with a stock Crawler set. I suppose not all of the exterior design elements will be possible to be implemented the way as it looks now, but i would be glad if the front and back could remain as close to what they look now. If anyone finds the time and interest to help out - you have my gratitude, as i would be stoked, if it would work out and i could give my son such a wonderful and unique present. About the build itself. I think i will call it "69 restomod". 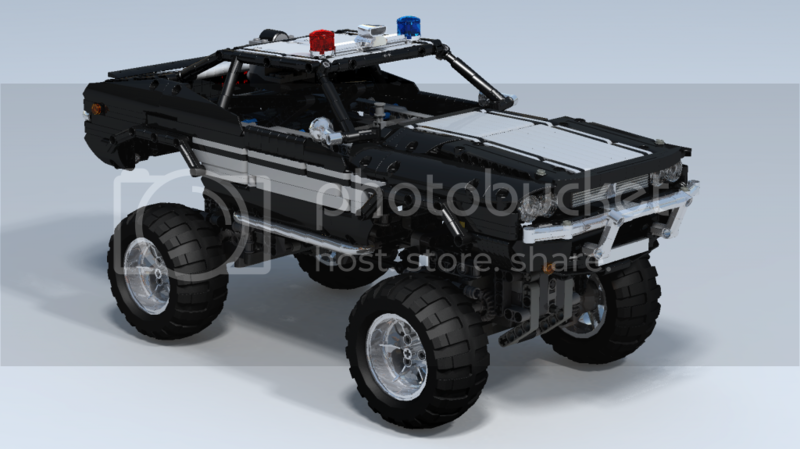 I wasn't aiming for a particular muscle car, but i was rather trying to figure out what can be done with the parts that lego offers for this scale, which would be not too big or small for radio control and PF functions. I was mostly inspired by 68 firebird, 68 mustang gt500, 69 dodge challenger - these are elements that hopefully can be recognized in the build. I've attached a couple of pictures and the LDD file in the hope that this might pick up some interest. Any advice or comments would be very welcome. You should be able to fit your 69er body on it. Let us know about your progress. Thanks for the info and links, TinkerBrick! My plan is actually to fit the body on the LEGO 9398 set base - going completely custom and ordering all parts, especially the mechanical stuff, separately would be a no go for a first attempt like this. Going with the 9398 as a base is a rather safe route - just have to figure out how to fit it on there. And this is where i really would rely on help. I have a LDD file of the 9398 crawler, but the amount of parts and complexity for an inexperienced builder like me is simply too much to deal with on my own. I'm playing around in LDD to see if i can mod the 9398 with my chassis, but currently i don't even understand where to start. Thanks, Zblj! I played around some more with the body and made a widened version, as the original one looked a bit toyish (i was aiming for the 19 points wide CRAWLER base/chassis, but the proportions on this car look off at this width). At this width it looks much closer to the scale of a real car. Looks like attachment size is limited (probably because i am a new user. I'll try to replace the original attachment with the wider version. I edited the original attachment and put up the 21 point wide version. That should also free up some space for the inner workings yet to (hopefully) come. I am not entirely satisfied with the sides (too messy and complicated in some places), especially the upper side, where the rear window slopes toward the trunk. Also i could not do what i wanted with the frame of the rear window - i would like it to be angled in 2 dimensions, just like the front frame (which i borrowed from the 9398 set). Also the wheel cutouts are a mess, but afaik there are not that many options in Technic parts to do nice round cutouts. Except for the flex rods, but that would compromise other aesthetic aspects - as you probably can tell, i am trying to go for a solid, rather smooth look, with as little of the studs or holes poking out as possible. Hello Charles,welcome to the forum. Have you tried using the bent liftarms for the wheel-arches or the bent connectors? I like to use those myself. Thank you Ryan and thanks for the tip! I've considered it - i suppose, if i end up putting the body on the Crawler set base, then this is what i'd do eventually. What i don't like about this solution is that i then have a bunch of holes/studs exposed, which i halfway successfully managed to avoid so far. Now i am considering the angle elements as an option, but haven't figured out a way to do this yet. Are there maybe any LEGO (non-Technic) parts that have smooth, round shapes and that could be somehow attached to the technic elements? I found some similar parts, but they were very wide and a bit too long ("left/right shell 3x8x2 w bow/angle"). The bent liftarms for the wheel arches will add a nice "fender flare" which would be appropriate for the size of the tires required for the 9398. If you are able to offset them by half a stud so they don't stick out from the body of the car by a full stud then that would be optimal. I don't have any familiarity with the crawler set otherwise I'd try my hand at integrating your design with it. 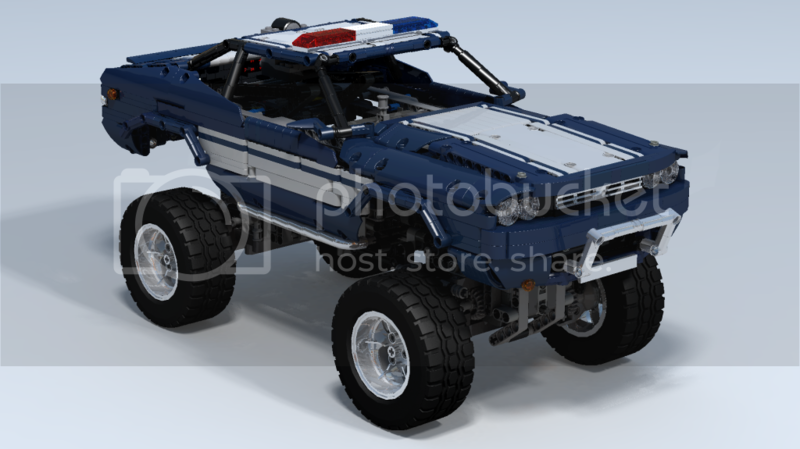 I am in the process of building a similar car with a dark blue shell and the white stripes like in the 41999 set. Over the past week or so I have been buying up most the dark blue technic components that I can find on Bricklink. I've found that there are not too many technic parts in this color. Outside of the 41999 set I believe that most of the dark blue technic parts are off of Bionicle sets. ..i.e. dont just give it to him made - my boys were following lego instructions properly since age 3 - its all part of the experience. Gradually getting where i would like to be in regard to the sides. Top construction still a total mess, but at least an approximation of the main lines i would like this to have. fasterthanlight, thanks for the great idea about offsetting the liftarms - that wouldn't look so exagerated. Not sure what i will end up with in regard to the wheel arches. Will play with some options later on. Btw. i did an attempt at making this car in dark blue - that is a nice color for vintage muscle cars and one of the common Mustang colors. It would also look more lively than black. Unfortunately there are many parts missing in this color, but here you can see what it might look with some substitutes - like the alternative 3x11x2 panel with more studs. Hence the result can't be nearly as nice as the black version (or white, red). This is an earlier iteration of my 69 model. White with blue stripes also would loog great, at least, if you are aiming for a mustang type of theme. at the moment it seems to me that they look better than lift arms, as they don't give the impression of such protrusion and the angle elements can portray the illusion of an arch better. Also there are far less studs and all in all it seems to better blend in with the rest of the body. I can't help with combining this (amazing) body with the 9398 but I just had to post how awesome this looks. Hopefully you'll find a way to make it fit. Thanks, dsoffers! For the most part it's just lots of luck and lots of patience - i'm a total noob with all of this. But now i have arrived to where i wanted to be with the body, at least in regard to the front, back and sides (and all of that only visually, as there are still almost no structures within the body to hold everything in place properly). The top is the next thing i would like to do properly, but i'm struggling with LDD and the angled beams of the rear window - can't get them angle correctly in all the dimensions like i need them to be - have lots of stuff to learn. But for now, here is the current state of the build. I did some changes to the grille and i think i have settled with this variation - the previous one was a bit too 2-dimensional. This one is more interesting and looks correct for late 60's muscle car designs. Thanks for all the input and support, guys! If anyone has the interest/time to help me out with getting this monster onto the Crawler base, please let me know. I have the Crawler LDD file (from LEGO LDD exchange, or however that catalog is called) and can provide it if needed. Also, i think this is a good general base for an american vintage muscle car style build - it is easy to construct the front grille and headlights, as well as the back lights into any direction - in order to get the appearance geared towards specific models. The general design elements of the muscle cars of the 60's are all very similar - for the most part they look a bit like big cigars that have been run over by a truck - kind of oval, rounded with straight open front/back and a massive arched wing above the rear wheels. As for present for son, may be he would like this: LDD file for this MOC will be ready soon. Adjusted the body to accomodate the Crawler axle positions, etc. I got carried away while designing the chassis as i was chasing after a correct scale to the real car. Hence the body now is wider than the original crawler at its widest point (19 studs, not counting in the extended wheel arches) - it is 21 studs wide as is now. It looks best this way, but if needed, i could convert it back to 19 studs wide. Would it be a big design issue, if i would keep the 21 stud width? 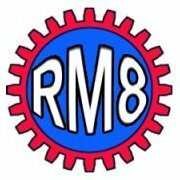 rm8, thanks for the input! Some time in the future, when i have some experience with real Technic parts in my own hands, i would like to make a custom chassis for this body, build it up to scale, etc. Also a fully MOC build as a first build might end up as a big birthday-present-fail, as some parts might be missing or wrong ones might be ordered, etc. It would be safer to have a standard base on which to build a custom body and then make some incremental modifications. I will definitely incorporate LEDs and for all lights possible ( i tried to design them with that in mind) - lights are a BIG bonus in any kids eyes. 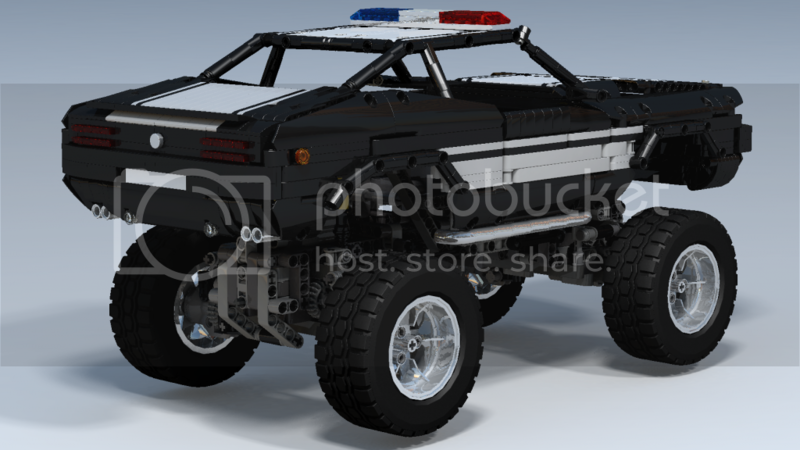 That MOC police crawler looks kool though! I like the 21 studs wide body! If I sent you a pm with my email address any chance of the LDD of the non crawler version ? I might then have a hack of a chassis in real bricks, my preferred way of working. Credit will be given to you if I ever complete it and post it! So below you see my compromise. It made the red color not contrast as drastically and it blends in rather well now. Btw. i'm particularily proud of the new taillights - i love the 68 pontiac firebird style taillights, but my previous version looked just too 2 dimensional and boring, so i found a simple way how to add some profile, but not too much, making them 3dish. 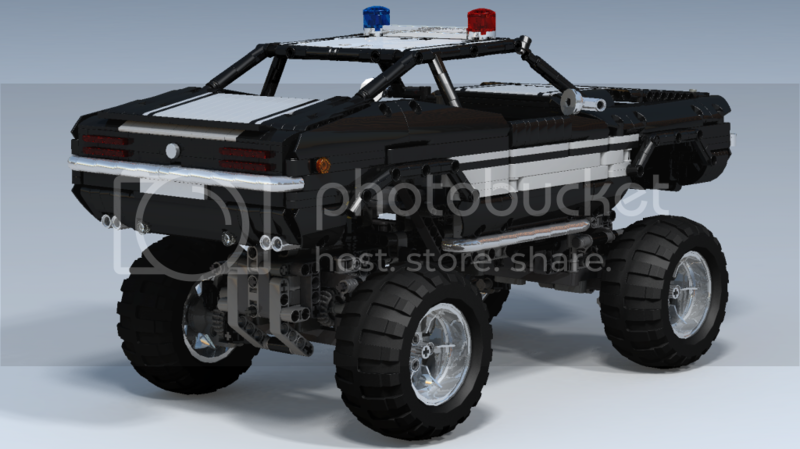 The newest LDD file added (of this particular build version). Due to my noob status, i have a limit of 100kb uploads total - so i always have to delete the previous attachment.